Researchers have measured an important physical effect in the most extreme conditions on Earth, and in doing so created gamma rays of record-breaking energy. An international team of physicists, including Dr Anton Ilderton from the University of Plymouth, used cutting edge facilities to smash electrons travelling close to the speed of light with an intense laser beam. When this happened, the energy carried by the electrons was converted to ultrashort bursts of gamma radiation – which has applications in nuclear physics and medical imaging. So much energy was converted during the collisions that the electrons slowed down dramatically; scientists call this slowing 'radiation reaction’, a phenomena which is believed to play an important role in both neutron star and black hole physics. To measure radiation reaction, the team had to use a laser beam one million billion times brighter than light at the surface of the sun. 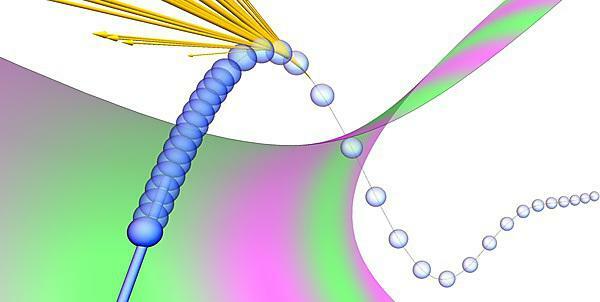 They detected bursts of light coming from the electron beam, with higher energy than ever previously observed in such an experiment. “Our results signal the start of a new era of precision experiments using ultra-intense lasers. This will not only allow us to answer fundamental physics questions, but can also be a step toward creating unique sources of radiation and particles for use in many areas of science and technology." The results of the research have now been published in Physical Review X. The experiment was performed on the Astra Gemini laser at the Science and Technology Facilities Council’s Rutherford Appleton Laboratory. Scientists say the data generated suggests the traditional, 'classical' approach to radiation reaction falls short, and that the conditions in the experiment were so extreme that the strange rules of quantum physics are necessary to describe the results. They plan to carry out further experiments in the coming year to explore this further. “The real result then came when we compared this detection with the energy in the electron beam after the collision. We found that these successful collisions had a lower than expected electron energy, which is clear evidence of radiation reaction." The full study – Experimental evidence of radiation reaction in the collision of a high-intensity laser pulse with a laser-wakefield accelerated electron beam by J. M. Cole et al – is published in Physical Review X.